From Full-Spectrum Cannabinoid to THC and Synthetic Cannabinoid Kits, Reviews of the Best Cannabis Testing Kits to Buy This Year. When you hear the phrase “THC test kit,” you probably think of the drug store kits parents buy to test their children or employers testing their employees to make sure no one has been partaking of certain substances in their free time. Those are only one type of marijuana test kit. The other category of drug testing kit tells you exactly what’s in the cannabis you’re buying, using, or growing. When it comes to testing you cannabis, there are a lot of options available. However, certain products stand out above the rest as the best marijuana test kits of 2019 due to their reliability, ease of use, and manufacturer’s reputation. What are Marijuana Test Kits? In the past, if someone wanted to test their cannabis for various chemicals and compounds, they had to have access to a laboratory full of specialized equipment. With the development of marijuana test kits, all of that changed. Today, cannabis testing is easily accessible to individuals both at home and while on the go, even if they don’t have a background in science or chemistry. Today’s marijuana test kits are more than just THC test kits, too – they help tell you the whole story about what’s in your cannabis. They come in various sizes, prices, and levels of complexity and can help you answer questions about the chemical makeup of something you’ve purchased and plan to ingest, as well as cannabis you’re growing. The following cannabis test kit reviews for 2019 will cover all you need to know to buy cannabis potency test kits, THC test kits, as well as synthetic cannabis test kits. Now that you have a basic understanding of what these kits do, the next step is to choose products. Whether you’re hoping to find a specific combination of cannabinoids, looking for a mellow, low-THC strain, or concerned about accidentally ingesting synthetics, there’s cannabis testing equipment for every need and budget. For those who are still wondering if they need a marijuana test kit and would like a quick explanation of what they do, scroll down below the reviews for an overview of the different types of marijuana test kits and what they do. The most detailed kinds of marijuana testing equipment, cannabinoid test kits analyze a sample of cannabis for a wide range of cannabinoids (the active ingredients in cannabis). While they’re often known as THC potency tests or CBD test kits, these tests actually do much more by showing percentages of a full spectrum of cannabinoids. Far beyond a simple yes or no test that simply detects the presence of THC or CBD, cannabinoid test kits give you a bigger picture of the potency of your weed by showing you each type of cannabinoid and the level at which it’s present. Alpha-Cat is one of the premier manufacturers of marijuana test kits, which is why their cannabinoid tests are among some of the most popular. They believe that especially when it comes to medical cannabis, patients need to be able to test for potency in order to medicate safely. They created their mobile test kits so that regular people with no scientific background would have an easy and affordable way to test their cannabis at home. Here are reviews of the different kinds of Alpha-Cat tests, who should buy them, and how they work. Every Alpha-Cat marijuana test kit functions as a tiny marijuana testing lab. Each one contains all of the essential equipment necessary to test a sample of material and decipher the results. This includes calibration charts for cannabis potency testing, test plates, dyes and test fluids, as well as all of the vials, jars, trays, pipettes, syringes and gloves needed to complete your tests. Kits also include an easy-to-use manual to guide you through the process. In addition to the included equipment, you’ll need a digital weighing scale and a well-ventilated area to work. While Alpha-Cat sells their Regular and Mini test kits for the purpose of determining the presence/potency of THC and CBD only, it’s important to note that these two products are capable of testing for the entire spectrum of cannabinoids. Besides THC and CBD, the Regular and Mini Kits also check for levels of CBN, THCV, CBG, and CBC. These two kits only contain calibration charts for THC and CBD, but the full charts are available for download online. The Alpha-Cat Regular Test Kit is the best value for the money, as it contains enough supplies to conduct between 10 and 40 cannabis potency tests. It’s an excellent middle-of-the-road option for those who need to test cannabis samples somewhat frequently. For those looking to buy a kit for occasional testing, the Alpha-Cat Mini Kit is an excellent choice. It’s the same as the Regular Kit in that it contains all of the necessary equipment for your tests (minus the digital weighing scale you must supply). The Mini Kit can also test for the full spectrum of cannabinoids, so it works well as a THC or CBD test kit as well as a potency test for other more minor cannabinoids. However, you’ll need to download the extra charts in order to be able to properly quantify the results of the Mini Kit. The Alpha-Cat Mini Kit is sufficient for conducting between 2 and 8 tests. Ideal for individuals hoping to start a cannabinoid analysis laboratory, the Alpha-Cat Mobile Lab is the ultimate in cannabis testing equipment. Far more than just a marijuana test kit, the Mobile Lab contains everything you need to deliver official Alpha-Cat cannabinoid analysis certificates, whether you’re testing your own crops or checking the authenticity of third-party products. The Mobile Lab features an extensive array of marijuana testing equipment necessary to produce certified cannabis analysis results, from a precise laboratory scale and a digital microscope to a digital scanner and a heating device and alignment tool. It also contains all of the trays, tubes, pipettes, and testing equipment contained in the smaller kits. Because Alpha-Cat values safety, they also include a laboratory coat, a face mask, and safety glasses. A protocol guide is included with the contents of the Mobile Lab, but with its purchase, Alpha-Cat includes something much more valuable: a 2-day onsite personal training program that covers the Alpha-Cat laboratory handbook. With your training complete, the Alpha-Cat Mobile Lab will allow you to perform between 100 and 400 cannabis potency tests. How Do Alpha-Cat Cannabis Test Kits Work? 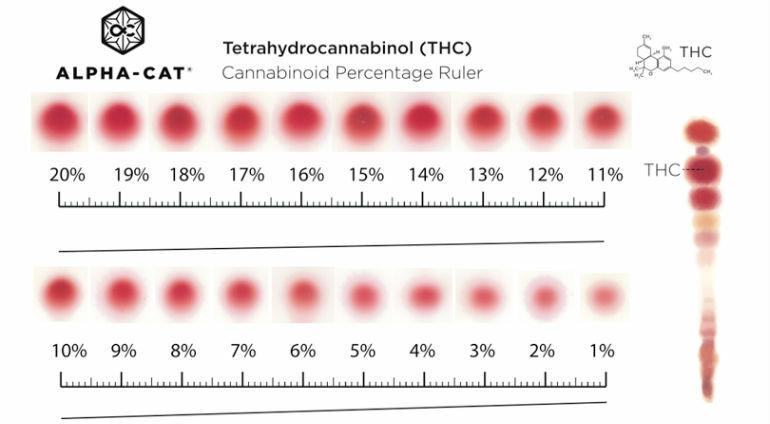 Alpha-Cat uses thin-layer chromatography (TLC) to allow users to see a visual representation of the cannabinoids present in a sample. When the test is complete, each cannabinoid will be clearly separated and rendered in brightly-colored spots. The number of spots will be dependent on the genetics of the plant used. This enables users to not only see what cannabinoids are present in a sample, but gives them the ability to see how the concentration of each. 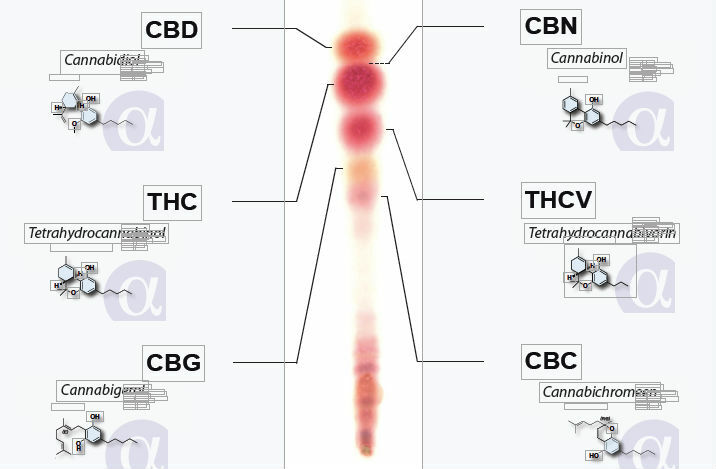 The higher the concentration of any given cannabinoid, the more intensely-colored the spot will be. Far more than just a THC test kit, the results from this type of cannabis testing equipment truly gives an idea of the cannabinoid makeup in order to determine the expected effects of a strain. This is particularly useful for those who grow or consume medical marijuana. Testing procedures are effective on more than just cannabis flower. The Alpha-Cat method will work for a wide range of cannabis and cannabis-infused products, from concentrates, resins, and tinctures to edibles. Analysis with Alpha-Cat marijuana test kits allows consumers and growers to understand more than just the cannabinoid profile of a specific sample or strain. Its chemotype-effect chart helps anticipate the types of side effects to be expected, while the symptom-curing guide is useful in determining which strains are most effective at treating various symptoms. Alpha-Kit products are the best choice for those who wish to know all there is to know about the makeup, potency, and potential effects of any cannabis strain they grow or ingest. THC test kits (THC testers) are a different breed of marijuana testing equipment. While still useful, they don’t offer results on a variety of cannabinoids and their concentrations. Instead, they simply offer a straightforward yes or no result on the presence of THC. 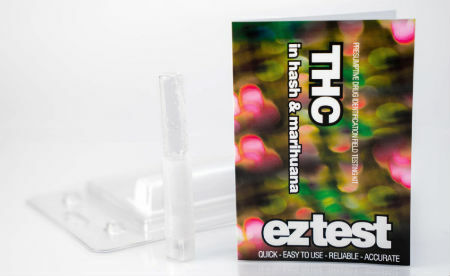 For THC identification test kits, EZTestKits are among some of the best-known and most reliable options. They’ve built a reputation based on quality, reliability, and an overall mission of promoting education and safe drug use by those who choose to partake. Based in Great Britain, EZTestKits has been selling drug testing kits for over 8 years. They were the first drug tests made available to at-home users. EZTestKits was founded to help people understand the issues that exist with drug purity and contamination, as well as the risks these pose. That’s why EZTestKits also offers a range of synthetic cannabinoid test kits (which we’ll also feature in this buying guide). They also ship worldwide and package their products in bubble wrap envelopes that feature no branding or logos. Known for providing a range of kits for fast and easy confirmation of other drugs and chemicals, EZTestKits has a quick and easy Cannabis (THC) Testing Kit in its product lineup. Using these handy little THC testing kits is simple. Break open the top of the ampoule and drop in a small amount of your sample. Cap the ampoule with the plastic lid and shake it well. Watch for the color change indicated on the included chart to confirm the presence of THC in the sample. Each Single-Use THC Testing Kit contains one testing ampoule. If you like to keep a marijuana test kit on hand, it’s worth buying the EZTest package that contains 10 THC-testing ampoules. The 10-Use Kit is much cheaper, per ampoule, than buying them individually and will ensure that you can always get quick results when you need them. It’s important to keep in mind that a THC Test Kit is not a THC potency test. THC testing kits only determine whether THC is present in a sample; they do not indicate the THC percentage. • Related Page: What Is THC? Synthetic cannabinoids are truly nasty – especially if you’re ingesting them unintentionally. One need only take a quick look at the headlines to see the side effects of synthetics. At best, they create a high that’s much more intense than marijuana. At worst, however, they begin to totally alter the user’s perception and create unwanted side effects. Hospitals and poison control centers have been inundated with calls from people experiencing unpleasant and even life-threatening reactions from taking synthetic cannabinoids. Among those reactions? Some experience extreme paranoia and anxiety, even hallucinating or having psychotic episodes. A rapid heart rate is common, as well as feeling agitated. Synthetics can cause uncontrollable body movements, as well as total loss of control over one’s behavior. In some cases, users have overdosed or committed suicide while under the influence of these substances. Instead of a laid-back evening enjoying a relaxing high, accidentally taking K2, Spice, or another synthetic cannabinoid could result in hours spent at the hospital…or even worse. Because addiction, bad trips, and death due to synthetic cannabinoid ingestion is such a real threat, drug testing companies have created portable synthetic cannabis testing kits that make it easy to know if the flower you’re handling is all natural or a chemical-laced concoction. 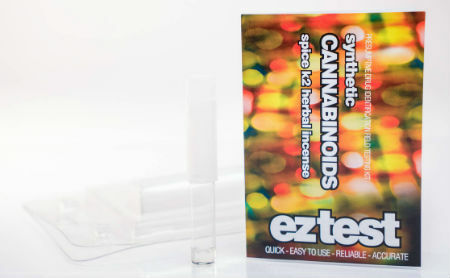 One of the most popular synthetic marijuana testing kits is by EZTestKits. This kit tests for the presence of a wide range of synthetic cannabinoids, from Spice and K2 and herbal incenses like JWH-250, JWH-200, CP-55/940, JWH-018/073/081, CP-47/497, and AM-694. Simply break open the ampoule and put a sample inside. Cap it, shake it, and wait for the color to change. Unlike the yes/no THC tests, EZTestKits Synthetic Cannabinoids Tests will change colors to indicate what type of synthetic agent may be present in your sample. Simply refer to the color chart on the included instructions to determine what type of synthetic the test has picked up. The 10-pack is a better value than the single-test pack, which is a great choice for those who frequently face situations in which they’re unsure of what may be in a substance they’re about to ingest. While the 10 Use Kit costs a bit more up front, it costs less per ampoule than buying them one at a time – and it ensures that you’ll always have a cannabis test kit handy when you need one most. Why Are Marijuana Test Kits Necessary? Years ago, cannabis testing was only possible by sending a substance off to a laboratory, but times have changed. Whether you’re testing your stash for safety or for medical purposes, marijuana testing kits offer quick and easy answers both at home and on the go. They’re excellent for testing the potency of cannabis, verifying the presence of THC, as well as screening for synthetic ingredients. 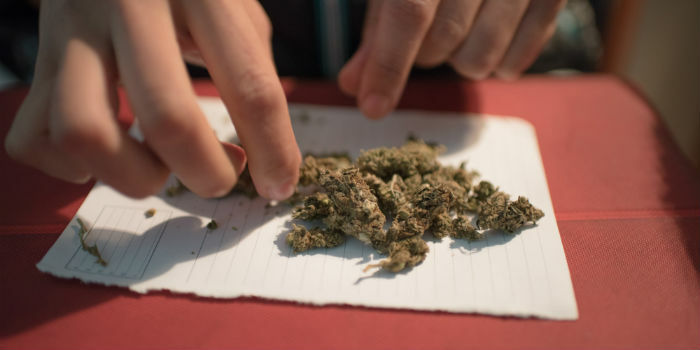 In recent years, researchers have started to understand more about the connection between the cannabinoids in different strains of marijuana and the side effects experienced by consumers. High levels of CBD helps calm anxiety, for example, while large amounts of THC does the opposite and can create agitation. Researchers have also discovered that a 1 to 1 ratio of CBD to THC causes the CBD to cancel out the psychoactive effects of the THC. This is ideal for those who need THC for medicinal purposes but don’t want the high. Other cannabinoids have similarly interesting interactions. This may be somewhat useful to recreational users who are searching for the ideal strain that will give them the perfect high, but it’s necessary information for those who use medical cannabis. The right cannabinoids in the right proportions can provide pain relief, treat nausea, or even help with insomnia. Testing for cannabinoid levels is essential for medical users who must get their medicine from non-dispensary sources, but it’s also helpful for patients to verify that dispensaries are selling product that lives up to what they’re advertising. Cannabinoid potency test kits aren’t just great for users; they’re also wonderful for growers working to perfect a strain for a specific purpose. Rather than guessing what the effects of that strain will be, this type of marijuana test kit gives growers the ability to understand the exact chemical makeup of the plant they’ve produced. When it comes to knowing how to measure THC potency, no scientific background or special training is needed; at-home test kits provide all the equipment and instructions necessary to see the big picture. If your only concern is whether a substance contains THC, THC test kits are smaller, more straightforward, and more affordable than their full-spectrum cannabinoid testing counterparts. By adding a small sample and waiting a few minutes, you can quickly if a substance is packing a psychoactive punch or has a zero THC level. THC testers can help you determine if you’ve been sold a substance that’s masquerading as a cannabis concoction but is actually a fake. Marijuana test kits quickly reveal the contents of your cannabis – from cannabinoids to synthetics. Sometimes, drug test kits are helpful in ruling out the presence of certain chemicals in a specific substance. This comes in handy if you make your purchases from random dealers rather than licensed dispensaries. As an increasing amount of drugs are being cut, combined, or substituted with dangerous chemicals, individuals must take personal responsibility for avoiding unwanted additives or synthetics in the drugs they’re ingesting. That’s why synthetic cannabinoids test kits are so essential. While cannabis can result in unpleasant side effects at extremely high doses, it’s not known to be dangerous or deadly. Synthetic marijuana is a different story. Because synthetics are made of varying combinations of chemicals, it’s tough to know what’s in synthetic marijuana. Side effects can range from anxiety and agitation to a very rapid heartbeat, vomiting, lethargy, confusion, and even death. Can’t you simply look at your bud and tell if it’s fake? Because synthetic cannabis comes in a variety of forms, it’s not always that easy. Sometimes, it can be mixed in with real weed or added to other herbs or tobacco, making it difficult to detect. A synthetic cannabis test kit can prevent you from having a nasty experience – or even save your life. Cannabis and THC test kit manufacturers work to make it easier for legal recreational cannabis users to test products in order to achieve the kind of high they enjoy, as well as enabling medical users to pick strains that best suit the kind of symptom relief they need most. They also recognize that many individuals are going to use cannabis and other drugs whether they are legal or not and hope to empower them to identify harmful synthetics and imposters. With cannabis use on the rise and a growing number of legal dispensaries opening across the globe in recent years, it’s more important than ever for people to be able to know what they’re consuming. This includes understanding the potential effects of different cannabis products and strains, but it also means being able to prevent accidental ingestion of dangerous synthetics. Companies like TestKitPlus and EZTestKits have devoted years of work to making drug testing easy and accessible to people whether they’re at home or on the go. Both manufacturers ship their products worldwide. While TestKitPlus makes laboratory-quality, professional test kits, EZTestKits offers marijuana test kits that are single-use and easily portable. Cannabis testing equipment gives people this power – leading to a safe world for recreational users, medical users, and non-users alike. Alpha Cat Mini Cannabinoids Test Kit – Levels of CBD, CBN, THC, THCV, CBG & CBC, 2 to 8 Tests. Alpha Cat Regular Cannabinoids Test Kit – Levels of CBD, CBN, THC, THCV, CBG & CBC, 10 to 40 Tests. EZ-Test Cannabis/THC Single Use Test Kit – Tests for presence of Marijuana/THC. EZ-Test Cannabis/THC Test Kit 10 Pack – Tests for presence of Marijuana/THC. 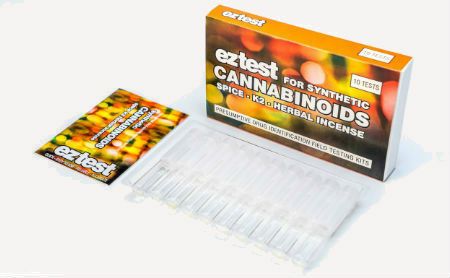 EZ-Test Synthetic Cannabinoids Single Use Test Kit – Tests for presence of Synthetic Cannabinoids. Spice, K2, and Herbal Incenses. EZ-Test Synthetic Cannabinoids Test Kit 10 Pack – Tests for presence of Synthetic Cannabinoids. Spice, K2, and Herbal Incenses. Using any sort of illegal drugs is not recommended; some substances may be damaging to your health. The information presented here is for educational purposes only. Drug Test Kits - From cannabis to cocaine, the most reliable and user-friendly drug testing kits of 2019. Cocaine Test Kits - How to buy the best cocaine test kit: from identification and purity to cocaine cuts. LSD Test Kits - Buying the best LSD test kit – from Ehrlich tests to LSD cuts test kits. Marquis Reagent Test Kits - A guide to choosing the best Marquis test kit to suit your needs. MDMA Test Kits - Buying the best ecstasy test kit – from identification and cuts to MDMA purity tests. TestKitPlus Review - An in-depth review of TestKitPlus, a leading drug test kit manufacturer.